Found often in schools, hospitals, offices, retail settings, and for grid ceiling applications, LED troffers are rectangular light fixture that fits into a modular dropped ceiling grid, which are usually 2’x2′ or 2’x’4. Troffer fixtures initially used fluorescent bulbs, such as the T5, T8, or T12. 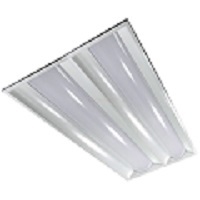 There are LED Troffer retrofits available or if you are putting in new fixtures, high-efficiency LED lay-in troffers and LED Flat Panels are available. These fixtures are available in multiple lumen light outputs, and warmer white (35K), cool white (41K), and bright white (50K) colors. Many LED panels deliver a polished look with their sleek design and advanced light dispersement. This Maxlite 2’x4′ LED Volumetric Troffer model runs on 45 watts and generates 3985 lumens. One of the best advantages of using LED 2×4 Troffers, is that the bulbs generally last 50,000 hours, versus only 30,000 hours for an average T8 LFL. This means less calls to the maintenance department to change bulbs in the facility. To view Conservation Mart’s wide selection of LED Troffers and Panels, please visit our website.